Feel right at home when you relax in this leather loveseat from our Home Traditions line. The smooth, semi-attached square back is banded and corded with the added comfort of a baffled bag in the back. The smooth, rolled arms flow into the stepped-in back where they converge with the contoured and padded lower arms. The front of the arms are covered with face caps that are accented with brass tacks for a distinguished look. This stunning assembly rests on distinctive bun legs which are finished in a choice of Distressed Pecan or Antique Black wood finish. 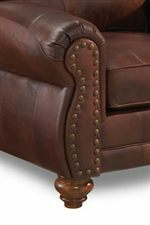 The Noble Traditional Leather Loveseat with Nailhead Trim by Best Home Furnishings at Best Home Furnishings in the St. Louis, Chesterfield, St. Charles, MO & Waterloo, Belleville, Edwardsville, IL area. Product availability may vary. Contact us for the most current availability on this product.